Masonry could be of two materials: brick or stone. Brick was handy - literally. A single brick could be picked up with one hand and easily placed. No grunting, groaning, straining, pushing and all that as with a large block of cut stone. Plus, in areas without natural stone, such as some places in the Lowlands, there could be found clay, and from such brick made in abundance, sometimes close by the construction site. Engineers and fort commanders liked brick for another reason. When hit, a cannon ball usually punched through the brick instead of shattering the face. Likewise, soft stone tended not to shatter. Some spots on a fort, however, were thought to require a hard face to deflect instead of absorb shot. One was at the outward point of the bastion. 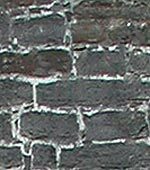 If brick was used for this, preferred was "clinker" brick, fired in the hottest part of the kiln to make it especially hard. If cut hard stone was mixed with brick, it could instead be used at such a point. 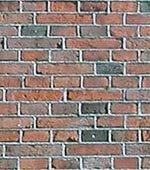 Stone had the advantage over brick in that it did not require firing - no overuse of local wood resources that could be for heating homes and for building. Plus one cut stone was deeper than any brick, offering greater strength (unless the engineer called for a wall several layers deep in brick, which called for more brick, which called for more firewood). Some masonry forts employed both: shaped stone for the foundation and edging at bastions and around gates, and brick for the walls themselves. Considering what we've already learned about the robustness and size of artillery forts, it shouldn't surprise us that their construction ate up prodigious amounts of stone and brick. For example, building the citadel of Lille from 1667 to 1670 consumed 60 million bricks and 3,300,000 long foundation stones. Much of that construction material was not even visible in the finished product but was under and within as support. Of interest, there is no reference to concrete as a facing material. Likely it was not used to any extent for that. Turf in wall. Plus, that trapezoidal-shaped thing is a wooden cannon platform. The astute reader will note in this and further pages that the tops of walls were not solid masonry. They had turf between facings. That was to absorb splinters of stone or brick that cut along the wall tops when a cannonball struck the upper edge.